First of all, you need to save the application to your computer. It's slightly different depending on your web browser - got a warning message or not. Anyway, click Save or Keep when you click the download button. We promise the application is 100% clean. You'll get a .exe (for Windows, about 30MB) or .dmg (for Mac, about 30MB) setup file. Next, the installation steps are various depending on your operating system. Usually, you can find the downloaded app at the bottom of your web browser. If it isn't there, go the Downloaded folder of your Windows system. Double click the .exe file to open the installation wizard, it will guide you through the installation process. Now you can go to play the video like usual and you'll see a floating download button next to the playing video. Not found the download button? Make sure it's installed to your web browser by going to the Settings page. Alternatively, go to the Preferences > Download tab of YouTube Downloader and click Repair. The browser plugin is necessary to download online video from your browser. Or you can try the Paste URL to download online video from the program directly. Locate or find the downloaded application and double click it. The installation wizard will show up. Simply drag and drop the app to the Applications and it's done. The floating download button will be added to your web browsers (Safari, Chrome and Firefox). You can just watch video like before and click the Download button if you want to download it. If you haven't found the download button, check whether the addon has been installed or not (Safari: Preferences > Extensions; Chrome: Settings > Extensions). You can also open the application and go to Preferences > Extensions to uninstall/install the browser plugins. 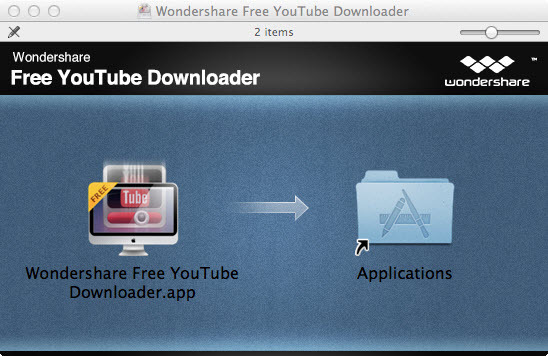 Here we introduce 2 ways to download YouTube video with Wondershare YouTube downloaders, regardless of Mac or Windows. Using the Download button: Simply click the Download button appear next to the video player. Using Paste URL button: Copy the URL from web browser and click the Paste URL in the YouTube Downloader. 1. The Download All button will appear on YouTube User Page, Artists' Playlist, Channel, Category, Course when a playlist is included. After click the Download All button, you can choose which videos to download. 2. You can leave the video download in the background and continue watching your video. Batch downloading is supported. Now you can download video 3X faster by turning on the Turbo mode in the Preferences. In the Downloaded tab, there is a Convert button for every video. Simply click it and a format selection window will open. Hundreds of media formats are supported, including but not limited to MOV, MP4, WMV, AVI, 3GP, FLV, MKV, MPEG-1, MPEG-2, WebM, and SWF. The option "Export the converted files to iTunes if possible" will be very helpful if you want to import the downloaded video to iTunes and sync with your iPhone, iPod and iPad. Wondershare YouTube Downloader has a killer feature: You're able to download YouTube video to a specified format directly. What you need to do is simply switching on the “Download then Convert” mode in the primary window. You need to select an output format in the pop-up window and hit “OK”. From then on, all downloaded video will be converted to selected format. Extremely convenient! 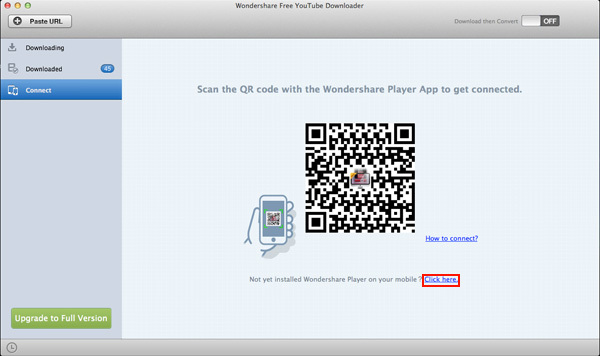 Start the Wondershare Player’s app on your device and go to Transfer via WiFi->Scan QR code to scan the QR code in the Connect window as below. This way, You've got Wondershare YouTube downloader and Wondershare Player connected. Go to the Downloaded tab to click the Transfer icon or right click the video to select Transfer to mobile. Note that both of your device and computer should use the same WiFi network. You’ll see the interface of the progress of the transfer.